Evidence of human creativity and artistic expression goes back more than 40,000 years. Understanding the evolutionary precursors of these human cognitive capacities has increasingly focused on comparative investigations testing animals. Here we review new evidence about triadic chord perception in pigeons to evaluate their auditory and cognitive mechanisms for potentially experiencing musical-like sequences. Pigeons add an important perspective to comparative investigations because they are a nonsongbird with an unlearned vocal repertoire. Using observations collected using a relational same/different discrimination, pigeons showed a capacity to discriminate five chord types. The relative similarity perceived among the chords was similar to that previously found in humans. Further analyses of this discrimination suggest pigeons may possibly process the individual tones that compose the larger harmonic structure of the chords. The results reveal that pigeons can discriminate, remember, and compare sequential harmonic structures over several seconds. Despite these auditory capabilities, doubts are raised as to the ultimate “musicality” of these kinds of discriminations in this particular bird species. Author Note: Robert Cook, Department of Psychology, Tufts University, 490 Boston Avenue, Medford, MA 02155. Correspondence concerning this article should be addressed to Robert Cook at Robert.Cook@tufts.edu. Acknowledgments: This research and its preparation was supported by a grant from the National Eye Institute (#RO1EY022655). I express my appreciation for the contributions of Emily McDowell, Ryan Oliveira, Matthew Murphy, Daniel Brooks, and M.A.J. Qadri to various parts of this research effort. Home page: www.pigeon.psy.tufts.edu. Evidence of human artistic and creative expression stretches back more than 40,000 years (Morriss-Kay, 2010). Over this period, a number of recognizable expressions of art and aesthetics have been found, stemming from the imagination and technical skills of the human ancestors producing it. This expression is easily visible in the plentiful sculptures and cave paintings left by our predecessors. Whatever their motivations for creating these “art”-ifacts at the time, the cognitive activity underlying their design, and the likely emotional resonance they may have generated, are hard to deny. Slightly more perplexing to interpret are the historical remnants of the different instruments presumably used to generate musical sounds (Conard, Malina, & Münzel, 2009; Sachs, 2012). The ephemeral and momentary nature of sound and music makes for a particular challenge to understanding the meaning and function of such instruments and their contributions to creating sounds. Given the universal nature of music in modern human culture, it is easy and natural to presume that our ancestors were engaged in this activity. How the different artifacts identified as musical instruments were used to produce specific sounds and their relationship to the forms of music we understand today remains elusive. A wide variety of approaches, ranging from archaeology to psychology, have been brought to bear toward understanding the origins and manipulation of sound and its musical impact within the human experience (Wallin, Merker, & Brown, 2000). Because understanding the evolution and development of musicality is a central part of these issues, comparative approaches examining different animals make valuable contributions to answering such questions (Fitch, 2006; Hauser & McDermott, 2003; Hoeschele, Cook, Guillette, Brooks, & Sturdy, 2012; Hoeschele, Merchant, Kikuchi, Hattori, & ten Cate, 2015; Marler, 2000). Musicality attempts to identify the basic cognitive, biological, developmental mechanisms that contribute to more formal activities like music (Honing, ten Cate, Peretz, & Trehub, 2015). This is a useful distinction; it is unlikely that music emerged in our hominid ancestors fully formed and invites a more comparative approach looking at such capacities in nonhuman animals. By understanding the cognitive and biological precursors of musicality that might exist in different classes of animals that are similar and dissimilar to humans, it should contribute insights as to how music, language, and cognition arose within our hominid lineage. The ubiquitous nature of bird vocalizations has always made this group of animals particularly attractive for such comparisons. The complexity of these vocalizations and their activation of our internal appreciation of tonality and musicality has even resulted in calling them “songs.” Although these vocalizations serve clear mating and territorial functions and are not as open-ended as true human music or language, the fact that many birdsongs are learned and modified after birth in many species makes understanding how birds process complex sequences of sounds a compelling area of investigation (Bolhuis, 2013). For example, Patel’s recent hypothesis regarding the relationship between music perception, beat induction, and vocal learning is one of several ideas that has put bird vocalizations in the theoretical spotlight (Patel, 2008). He suggested that vocal learning is fundamental to the ability to understand and process beat-based rhythms from complex sound sequences. His reasoning is that this type of musical entrainment may rely on the same tight linkage between the auditory and motor circuits used in vocal learning. One implication of this vocal learning in rhythmic synchronization hypothesis is that animals that do or do not learn their vocalizations may differ in their capacity to process auditory sequences with a musical-like entrainment (Hagmann & Cook, 2010; Patel, 2014; Patel, Iversen, Bregman, & Schulz, 2009; Schachner, Brady, Pepperberg, & Hauser, 2009). One portion of the research in my laboratory has focused on testing auditory processing in pigeons. Some of these investigations have included auditory stimuli that involve music-derived elements (Brooks & Cook, 2010; Hagmann & Cook, 2010). Because of the proposed impact of vocal learning on auditory perception and potentially understanding music, we have focused on pigeons precisely because they do not learn their limited number of vocalizations (Baptista & Abs, 1983). By looking in detail at the auditory behavior and cognition of a nonvocal learning bird species, like a pigeon, and comparing its abilities to those species that do learn their vocalizations, we can gain further insight into what aspects of sound and music are critically tied to experience, vocal learning, and the cognitive and neural mechanisms underlying auditory processing. What is currently known about auditory and musical processing in this common bird species? It has been known for some time, for example, that pigeons can discriminate among musical compositions created by different composers. Porter and Neuringer (1984) found that pigeons could be eventually trained to discriminate extended pieces of music by Bach from those composed by Stravinsky. This discrimination seemed independent of note sequence and overall intensity. Following this training, the pigeons also categorized novel excerpts of music along lines that matched human judgments of the same excerpts. Given the considerable differences in musical style, instrumentation, and other distinctive elements of these composers and the specific musical compositions tested, the actual musicality of the pigeons’ discrimination is difficult to interpret. Nonetheless, this intriguing finding provides a foundation for exploring this general topic in more detail. The complexity of music is one of its creative wonders but simultaneously its greatest challenge to experimental analysis. Rather than attempt to investigate the discrimination of music in its totality, we have concentrated instead on looking analytically at several separate and essential components or building blocks of music. Broadly, these components examine the processing of rhythm, harmony, and melody within extended auditory sequences. By examining each of these domains in relative isolation, we can better identify those features or components of auditory and musical-like processing that pigeons may or may not share with humans and other animals (Brown & Jordania, 2013; Honing & Ploeger, 2012). When these domains are then collectively examined together, the results should help clarify how top-down cognitive and bottom-up auditory mechanisms interact to produce the acoustic experience of this avian species and any potential musicality it may or may not possess. Within this larger framework, the present article focuses on discussing new information related to the relational processing of harmonic structure by pigeons. Specifically, this article examines how concurrent tones that fit the human notion of musical triads or chords are processed by these birds. The vast majority of Western musical conventions’ basic structure centers around the notion of chords and their relations. Chords are created by the simultaneous sounding of multiple notes (arpeggios being “broken” chords in which the notes are played in succession). The major triad is a chord built from three notes. These notes consist of the first, third, and fifth notes of the diatonic musical scale. It is the composition of the intervals between these notes that gives this musical structure its distinctive and stable musical structure that can be recognized across different tonal centers or keys. Major chords are often recognized as stable anchors in a piece of music and generally associated with melodic and emotionally happy motifs. Other types of chords can be created from this basic structure by altering different notes by a half step or a semitone. A minor chord can be created by lowering its third by a semitone relative to the major chord. This type of chord is often associated with sadder emotional states. A suspended fourth or sus4 chord can be created by raising the third by a semitone. A flat five chord can be created by lowering the fifth by a semitone, whereas an augmented chord can be created by raising the fifth by a semitone. The major, minor, sus4, and augmented chords regularly appear in different types and genres of music, whereas the flat five chord is typically played in musical contexts by also including the seventh to create to a minor seventh flat five chord. Humans can easily hear and respond to the distinctive qualities of these harmonic structure. The notes of these five chord types are depicted in Figure 1 using standard musical notation (audio examples of these five chords are also included). Figure 1. The five chord types tested previously by Brooks and Cooks and tested here using a same/different discrimination. This musical notation captures the alterations in the third and fifth notes of the diatonic scale that create these triadic harmonic structures. In the current observations, the root note of each chord varied over four values and were additionally transposed over three octaves. Our original question was whether pigeons could do so also. Brooks and Cook (2010) found that pigeons, like humans, could learn to discriminate among these different types of musical triads. Using a go/no-go discrimination task, the pigeons received food during trials when a C-major chord was being played from two speakers located in the testing chamber’s right and left walls by pecking at a centrally located purple square on a frontally placed computer monitor. This major chord was the S+ stimulus in this study, and pecking during it was compared to the four other described chord types and that were played as negative S– stimuli on other trials. On those S– trials, the pigeons received no food for pecking during the presentation of a minor, sus4, augmented or flat five chord. All of these chords were created in the key or tonal center of C.
They found in their first experiment that the majority of pigeons could learn to discriminate among these chords. All four S– chords elicited significantly fewer pecks in comparison to the rewarded S+ major chord in three of the five pigeons tested. Further, manipulations of the fifth as expressed in the flat5 and augmented chords supported better discrimination than did the comparable manipulations of the third in the minor and sus4 chords. 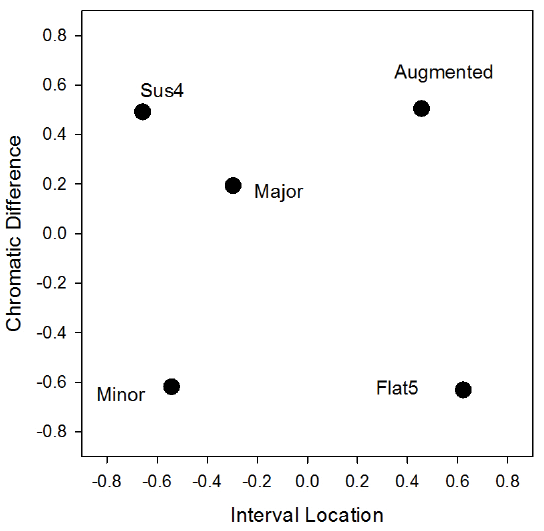 As measured by the differences in peck rate during their presentations, the augmented chord was seemingly perceived as being the most dissimilar from the major chord, whereas sus4 chord was perceived to be the most similar. These outcomes generally align to the similarity judgments of humans comparing such chords (Hoeschele et al., 2012; Roberts, 1986). The results were also consistent with the possibility that the pigeons were sensitive to the consonance and dissonance of the chords, as sus4 and minor chords are typically judged to be more consonant or smoother sounding than the other two types of chords, which are perceived as having a rougher or clashing quality. These pigeons were then shifted to a new root or tonal center based on a D diatonic scale and tested with these chords. By shifting the chords to a new root, the relative interval structure of the chords remains constant, but the absolute frequencies involved are changed. In this second experiment, they generally performed more poorly than the first. They showed little immediate transfer from the previous C-rooted training despite the same harmonic relations present in these D-rooted chords. With additional training, the pigeons did eventually learn to discriminate at above-chance levels, but the learning process was clearly difficult and not robust, with most of the learning occurring primarily with the chords containing manipulated fifths. Unlike the pigeons, humans readily show transfer in such shifted situations (Hoeschele et al., 2012). This ease results from our sensitivity to relative, but not absolute, pitch. This allows us to be flexible and hear transpositions of music across different musical keys (Dowling & Fujitani, 1971). Hoeschele et al. (2012) also found that chickadees more readily learn this type of root shift than did the pigeons. Overall, it seems that pigeons were not as flexible in recognizing this type of harmonic information across these different pitch contexts. One distinct possibility is that pigeons may rely on attending to more of the absolute pitch properties of these complex auditory stimuli to discriminate them (Murphy & Cook, 2008). If so, this would limit any capacity to relationally shift or modulate to a new root or other values (e.g., Friedrich, Zentall, & Weisman, 2007; Hulse & Cynx, 1985; Weisman, Njegovan, Williams, Cohen, & Sturdy, 2004). In this special issue, Hoeschele nicely reviews the evidence on how birds use both relative and absolute pitch information in learning a variety of discriminations. With visual stimuli, several factors seem to influence whether pigeons use absolute and relational features in learning discriminations (Cook, Levison, Gillett, & Blaisdell, 2005; Cook & Smith, 2006; Cook & Wasserman, 2006). When given a few exemplars or highly repetitive training, pigeons in visual tasks are readily able to memorize the absolute properties of stimuli (Cook et al., 2005). Stimulus control of this type is reflected in poor transfer or generalization when tested with novel stimuli. In contrast, when consistently challenged by larger sets of exemplars, pigeons are able to abstract also the relational properties of visual stimuli by exhibiting excellent transfer to novel stimuli (e.g., Katz & Wright, 2006). Thus, the nature of training is one important influence on what birds learn in visual discriminations. By extension, these same factors likely influence the relative use of relational and absolute factors in auditory discriminations (Cook & Brooks, 2009; Murphy & Cook, 2008). Within the auditory modality, one good example of relational discrimination learning by pigeons involves their behavior in a sequential same/different (S/D) discrimination. Cook and Brooks (2009) found that pigeons could be readily trained to discriminate among same and different sequences of sounds. Using large sets of tonal (e.g., single notes from different instruments) and complex stimuli (e.g., recorded bird songs), pigeons discriminated sequences where a randomly selected sound was repeated 12 times in succession (a same trial) from sequences that consisted of 12 different sounds sequentially presented (a different trial). Using a go/no-go discrimination, the pigeons were rewarded for pecking during trials with different sequences (S+) being played but not during same sequences (S–). Finally, in this procedure, a small fraction of different trials were programmed not to be rewarded. These probe trials allowed peck rates to be measured without the contamination of eating from the food hopper or being signaled by the hopper (all discrimination results presented subsequently are derived exclusively from such probe trials). In the S/D procedure, the pigeons learned to differentially peck during these two sequence types and exhibit good transfer of this learning to sequences composed of novel auditory stimuli of different types. This successful transfer indicates a discrimination learned by comparing the same and different auditory relations of successive sounds. This flexibility created opportunities to explore not only same/different learning but also how animals process different types of auditory stimuli (cf. Cook, Qadri, & Oliveira, 2016; Dooling, Brown, Klump, & Okanoya, 1992; Dooling, Brown, Park, & Okanoya, 1990; Dooling, Brown, Park, Okanoya, & Soli, 1987). The latter emphasis was used here to further explore how pigeons process harmonic information in chords. Here, the S/D discrimination approach is used to examine several questions opened up by Brooks and Cook’s aforementioned research on pigeon chord perception. One of the more important of these questions concerned whether the pigeons could discriminate chords based on the relational structure of the intervals composing a triad. The limited transfer found when their birds were shifted from C- to D-rooted chords suggests that absolute factors may have been importantly involved in learning the discrimination. To examine the issue properly, it is necessary to test chord perception relationally by changing the tonal center or absolute pitch information within a session. This was not the case in Brooks and Cook’s experiments, where only one tonal center was tested at a time. By having unpredictable tonal centers, the pigeons are required to process the interval relations within the chords rather than relying on absolute properties, as might have been encouraged by Brooks and Cook’s (2010) use of a single tonal center and limited number of stimuli. A second and related question was tied to revealing more about the perceived similarity structure among chords. Brooks and Cook’s (2010) procedure revealed similarity relations only relative to the major chord. It would be valuable to know how each of the different chords is perceived relative to one another. For instance, Dooling has used multidimensional scaling procedures to fruitfully investigate the similarity relations of a variety of sounds primarily in budgerigars (e.g., Dooling et al., 1992; Dooling et al., 1990). Finally, we wanted to examine if pigeons could use short-term memory to make sequential comparisons of different chords across time. Given their design, Brooks and Cook’s (2010) pigeons heard only one chord type on each trial. Thus, their discrimination of the chords must have involved using a reference memory comparison of the currently presented chord against a long-term representation of the S+ major chord. The more immediate juxtaposition of the chords possible with the S/D approach might potentially reveal new or different aspects of the processing of these stimuli not allowed by their isolated presentation. Further, musical structures rely on this ability to remember and compare sounds over time to create rhythm, melody, and expectations. Because of its procedural flexibility and analytical tractability, the S/D task is well suited for exploring such theoretical questions. Accordingly, we introduced and tested musical triads with four experienced pigeons already quite familiar with this type of auditory S/D task. This experience involved tests with a wide variety of simple and complex auditory stimuli. At the point where we introduced the chord stimuli, the pigeons were being tested daily with S/D trials composed from a library of 540 tonal stimuli and 72 complex sounds (26 bird sounds and 46 man-made and nonavian animal sounds). The tonal stimuli were generated from 14 musical instrument timbres and pure tones playing single notes over a range of three chromatic octaves. Some discussion and analysis of the processing of these types of sounds by the pigeons can be found in Cook et al. (2016). At the start of these observations, these “baseline” sounds were being presented each session in different and same trials consisting of sequences of twelve 1.5-s presentations of the individual sounds. 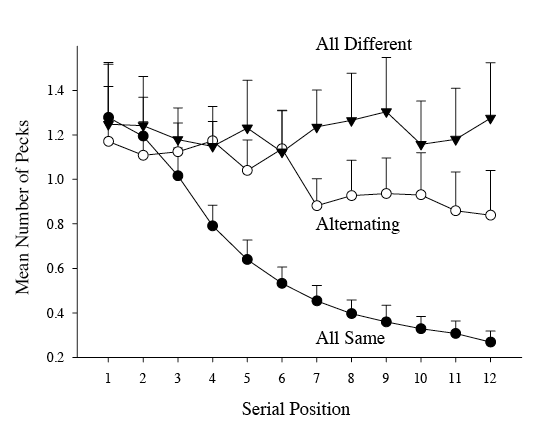 On the same trials, one randomly selected sound was repeated 12 times in succession within a trial (e.g., AAAA . . .). On the different trials, 12 randomly selected different sounds of a particular type were played once to form the 12-item sound sequence (e.g., ABCD . . .). Each 1.5-s presentation was separated by a 50-ms interstimulus interval of silence. The different trials were further composed from category-like groupings of the sounds. Thus, a different trial might consist of just tonal sounds or birdsongs, but not a mixture of the two. These acoustic groupings comprised (a) pitch differences over three octaves involving a randomly selected musical instrument timbre (labeled pitch trials), (b) different musical timbres played using the same note (timbre trials), (c) pure tones (pure tone trials), (d) birdsongs (birdsong trials) and (e) nonbirdsong complex sounds (complex sound trials). Comparisons of these five classes of different trials were made only to same sequences from the same class of auditory stimuli. Audio examples of typical same and different trials using stimuli from the bird song set of sounds are included. All four pigeons were performing well with each of these different classes of acoustic stimuli at the beginning of these observations. Figure 2 shows baseline S/D results during the initial phase of the experiment. The pattern displayed is typical of the dynamics of within-trial discriminations observed in this type of go/no go task across both auditory and visual modalities (Cook, Kelly, & Katz, 2003; Cook & Roberts, 2007; Koban & Cook, 2009; Qadri, Sayde, & Cook, 2014). The figure shows the mean number of pecks across the serial position of the 12 sound presentations composing each trial. Because the different trials were rewarded on a variable interval schedule, peck rates during these S+ sequences are high from the beginning to the end of each trial as measured again from probe trials. Because the S– same trials were never rewarded, the number of pecks systematically decline with each repetition of the sound in a sequence. The large difference in peck rates by the end of each trial type represents clear evidence of an S/D discrimination. We have found that pigeons can reliably discriminate a wide variety of sounds in this procedure and measurably begin to do so by the third or fourth sound presentation of a sequence. Although not shown, the pattern of discrimination in this figure reflects how the pigeons do with each of the classes of auditory stimuli previously mentioned (Cook et al., 2016). Figure 2. Baseline same/different discrimination results for all four birds in these observations. Shown are the mean number of pecks across the 12 individual sounds presented sequentially on each trial. All-different (ABCD . . .) and alternating conditions (ABAB . . .) were S+ sequences, whereas the same condition (AAAA . . .) was an S– sequence. The individual sounds on each trial were drawn from a large pool of sounds (see text for more details). The higher rates of pecking in the all-different and alternating conditions in comparison to the same condition are indicative the pigeons’ capacity to make auditory same/different discrimination. Figure 2 also shows behavior during a second type of different trial programmed to occur within a session, but with less frequency. These consisted of different sequence trials composed of only two sounds that alternated over the course of a trial (e.g., ABAB . . .). Because only two sounds are involved, these alternation trials allowed for a more precise determination of the features controlling the detection of their differences. We have found that such alternating trials consistently produce lower rates of responding within a trial than do all-different trials containing 12 different sounds. There are at least two possible reasons for that result. The first possibility is that two items are simply more difficult for the birds to discriminate than 12 different items. This might be related to their difference in acoustic entropy, for example (Wasserman, Young, & Nolan, 2000; Young & Wasserman, 2001; Young, Wasserman, Hilfers, & Dalrymple, 1999). A second possibility is that with each presentation within a trial, alternating trials also begin to have a larger two-item repeating pattern which the pigeons may interpret as “sameness.” Given their previous S– training with repeated sameness, this would correspondingly reduce their pecking similar to a single-item same trial. We do not know which of these reasons is responsible for the slightly reduced peck rate on such trials at the moment. That said, the analytic value of such alternation trials remains unchanged because of their precisely binary nature. Prior to testing for the relational effects of chord structure, we thought it would be valuable for the pigeons to have a working familiarity with these new sounds, but without necessarily engaging in explicit training to discriminate them. To do so, we introduced the five chord types tested by Brooks and Cook into the pigeon’s daily training for an initial period of 18 sessions (the period for the baseline S/D results shown in Figure 2). The chords consisted of the major, minor, suspended fourth, augmented, and flat five triads made using a French horn timbre. Unlike long 20-s chord durations in Brooks and Cook’s procedure, the individual duration of each of the 12 chord presentation was only 1.5 s, matching the baseline stimuli duration. Finally, instead of using just one root note, four root notes were used (C, C#, D, D#), and these were tested across the three octaves with which the pigeons were already familiar from their tonal trials (i.e., pitch-only and timbre-only trials). As a result, a set of 60 chord/root combinations were available. These chord stimuli were then used to compose different and same trials that were mixed into the ongoing baseline S/D trials. The different trials with chords consisted of a randomized mixture of 12 different chord stimuli as picked randomly from the 60 available stimuli. Thus, these trials consisted of random mixtures of the five chord types with different root notes over three octaves (e.g., D3-augmented, C5-major, D#4-sus4, . . .). Because of their prior experience with discriminating pitch in the baseline sequences, we thought that any discrimination on such trials was likely mediated by their considerable changes in pitch between stimuli rather than the unfamiliar chord structure within each sound. The same trials consisted of 12 repetitions of a chord type at one of the randomly selected 12 root values. The structure of these initial sessions consisted of 12 chord trials randomly intermixed with the ongoing baseline values of 12 bird song, 12 pure tone, 12 pitch, 12 complex sound, and 12 timbre trials. Each of these subgroups further consisted of six different and six same trials, with two of the six different trials being conducted as probe trials. Overall, the four pigeons showed significant transfer to these chord-based S/D sequences, showing a within-trial pattern of discrimination highly similar to the baseline stimuli over these 18 sessions (not shown in Figure 2). Although the chords were being discriminated in one sense, it was not possible to determine how the trials were being discriminated given the redundant nature of these stimuli and the design of the different trials (variable root and variable chord type). The next phase of the experiment was aimed specifically at examining if just the structural properties of the chords could be discriminated in this relational S/D context. For this, we introduced alternating AB probe tests using pairwise combinations of the five chord types. To eliminate the large within-sequence pitch differences in chord root note that were previously available, each test pair used the same root note, so only differences in chord structure were present (although the semitone pitch differences remained to define each chord type). This root note was randomly selected across trials to continue ensuring relational processing. These test sessions were conducted in four blocks of five sessions each, with a number of baseline sessions conducted between each one. Within a block, each test session tested a different chord type in combination with every other chord type (e.g., augmented vs. minor, augmented vs. major, etc.). As a result, all the pairwise combinations of the five chord types were presented twice within a block. Figure 3 shows the discrimination of the chords by the four pigeons combined over the 20 total test sessions. The figure displays the mean number of pecks from the all-different chord trials, the probe trials with the alternating chords, and all of the same trials that were constructed from chords. As mentioned, the high peck rates to the all-different chord sequences is not particularly revealing because of the redundant differences in pitch and chord structure in such sequences. More revealing is the difference between the sequences with the alternating chords and the same trials. Figure 3. Chord-based same/different discrimination results for all four birds during the test sessions. Shown are the mean number of pecks across the 12 individual sounds presented sequentially on each trial. The all-different (ABCD . . .) comprised sequences in which the rote note and chord types were selected randomly. The alternating condition (ABAB . . .) tested only two chord types involving the randomly determined common root note. The significantly higher rates of pecking relative to the same conditions are indicative of the pigeons’ capacity to make chord-based same/different discriminations. The pigeons found the novel pairwise chord trials more challenging. Although the difference in peck rate is considerably reduced, the birds showed peck rate differences between these alternating different and same conditions. These differences were significant for three of the four pigeons over the last six serial presentations. The fourth pigeon showed a smaller difference than the other birds, with the alternating condition being regularly and numerically higher across bins, but statistical tests could identify only a difference that was marginally significant. Besides the challenges related to item discriminability and any possible emergent AB “sameness” considered earlier, these alternating chord trials potentially contained additional difficulties for the birds. The pigeons never had been specifically trained to discriminate chord structure before, for example. The large and significant drop in peck rate in comparison to the all-different chord trials suggests that the large difference in root pitch among the different chords in that condition probably added a lot to the discrimination. This may even have overshadowed paying attention to the more subtle differences in chord structure as a result. Nonetheless, the pairwise differences between chords were being detected and discriminated. Moreover, this discrimination continued in a context of ongoing differences in the root note or tonal center of the chords from trial to trial. Thus, the pigeons were capable of discriminating based on just the relational differences among the chords. This extends the results of Brooks and Cook (2010) considerably, in which the pigeons did so based on only a single tonal center and with reference to only a single major chord. Besides establishing for the first time the capacity of pigeons to discriminate chords in a relational context, the pairwise structure of the trials allows one to examine the similarity structure of the chords as experienced by the pigeons. The results found that some chord combinations were consistently easier for the birds to discriminate than others. For instance, alternating trials testing a sus4 chord produced greater peck differences when being compared to an augmented for flat5 chord than a major and minor chord. To better examine the issue of the chords’ relative similarity and its effect on discrimination given all the chord combinations tested, multidimensional scaling techniques were brought to bear on the results. Multidimensional scaling is a data-reductive process that attempts to reveal the underlying structures within a set of data using a distance matrix. In animals, multidimensional scaling has a history of revealing similarity relations and structures in different types of complex stimuli (e.g., Blough, 1982, 1985; Blough & Blough, 1997; Dooling et al., 1990; Dooling, Okanoya, & Brown, 1989). Our goal was to generate a representation that would reveal the underlying psychological structure of the chords as judged by the pigeons. For these analyses, we examined the number of pecks over the last four presentations for all the alternating chord trials and same trials over the 20 test sessions. We employed PROXSCAL scaling procedures to examine the average number of pecks for each pairwise combination of chords based on all four pigeons. Given their training, we used the number of pecks as a distance metric of similarity, with low peck rates indicative of “same” perception or high similarity and higher peck rates as indicative of “difference” and greater dissimilarity. We tested a variety of dimensional solutions but found little explanatory benefit for solutions with more than two dimensions. Shown in Figure 4 is the best-fitting two-dimensional solution. Based on their behavior, the birds seemed sensitive to the frequency composition of the chords as reflected in their tonal structure. Four of the chord types fit into a relatively rectangular structure, with the major chord located internally among them. Although the identities of the underlying dimensions are not provided by the scaling solution, two candidates seem to describe the relations exhibited in this overall pattern. Located on the left side of the figure are the two chords in which the frequency of the third scale note in the triad (minor and sus4) was manipulated, whereas the two chords on the right side involved manipulations of fifth scale note (augmented and flat5) of the triad. Their relative location on the vertical axis seems to correspondingly reflect whether the altered note of each chord was increased or decreased by a half step. Thus, the two chords with the raised third and fifth notes are located toward the top, whereas the two chords with the lowered third and fifth notes are at the bottom. Figure 4. The best-fitting two-dimensional PROXSCAL solution based on the mean number of pecks for the combined results of four pigeons from the alternating chord trials. It is perhaps important that the major was not precisely located in the center of the rectangle. This was true across several solutions and found for each bird. It was more consistently located nearer the sus4 for three of the birds and nearer the minor chord for the last bird. That the location of major chord was not in the center suggests that part of the discrimination of these chords was not just a simple frequency computation. Rather, the major chord’s biased location suggests it had a greater perceived similarity with the minor and sus4 chords. This outcome is consistent to what was observed in the earlier chord study in which the sus4 and minor were the most difficult for the birds to distinguish from the major chord. 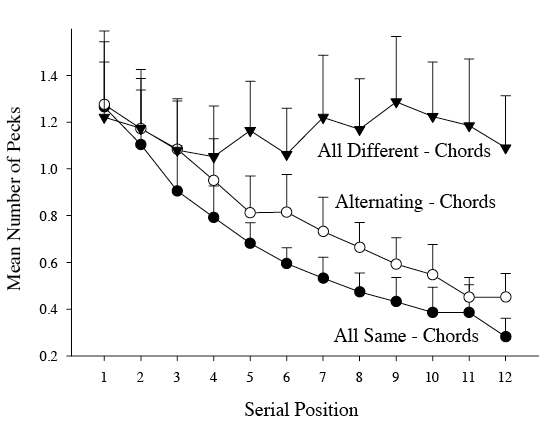 It is also similar to the judged similarity perception of these chords as reported by humans (Roberts, 1986). If the major is perceived as most similar to the sus4 and minor, a possible alternative description of the horizontal axis in Figure 3 is one based on the configural concept of chord consonance versus dissonance (see Toro & Crespo-Bojorque in this special issue for more on this general topic). Support for this alternative comes from the generally more consonant chords (major, minor, sus4) clustering toward one side of the dimension, whereas the more dissonant chords (augmented and flat5) cluster toward the other end of the dimension. This interpretation would suggest that the birds perceived the harmony created by the three simultaneous notes within each chord, perhaps a feature of the simpler frequency ratios associated with consonant intervals. Whatever the mechanism, the pigeons seem to hear the major, sus4, and minor chords as being more alike than not. We have now seen this result in two separate studies testing different procedures, root notes, and pigeons. Despite this configural possibility, the strong structural regularity within the scaling solution suggests that the frequency of the individual notes within triads was also perceived by the pigeons. Besides potentially knowing which notes were altered, they also appeared to know in which direction the note was altered. Humans readily perceive that minor and sus4 sound different from the major, for example, but it is likely that few outside of experienced musicians would recognize that these changes are by-products of half-step alterations of the third of a triad, much less whether this note was being sharpened or flattened. The same would likely apply for augmented and flat5 chords as well. Their dissonance would be readily perceived by most of us, but outside of musicians, few would recognize that this is derived from semitone alterations of the fifth. The pigeons, on the other hand, seem to readily recognize and react to this internal structure as reflected in the separation of the notes in Figure 4. This capacity suggests that the pigeons are sensitive to the individual frequencies composing the chord stimuli. If the pigeons can independently perceive or sample the individual notes, we may need to consider more elemental or featural explanations of their harmonic perception. The observations just reviewed reveal several new facts about pigeons’ perception of musical chords. One is the important demonstration that pigeons are not dependent on absolute frequency content to make chord discriminations. The four pigeons here were able to make chord-based relational S/D judgments within a trial over an unpredictable range of three octaves and four root notes within each octave. Thus, unlike the pigeons in Brooks and Cook’s (2010) chord discrimination experiment, these birds were more flexible over a broad frequency range with which they had prior experience. This indicates that the harmonic relations of the contrasting notes and intervals within the chords allowed the pigeons to discriminate the auditory sequences using short-term memory to make successive comparisons. This capacity is consistent with their established ability to make S/D discriminations across a wide variety of auditory stimuli (Cook & Brooks, 2009; Cook et al., 2016). With that said, the pigeons’ discrimination with just two alternating chords did appear to be challenging. Although significantly different from same trial presentations, the differences in peck rates were not large, especially in comparison to other auditory discriminations previously investigated. As already considered, there are potentially many factors that might have directly or indirectly contributed to this difficulty. Future research will need to determine, for example, whether this is a case of chords being difficult material to discriminate or whether the absence of direct training contributed to the relatively poor discrimination of AB presentations of these stimuli caused the reduced peck rate differences. Chord discriminations of various types have not always been easy for all tested individuals of the several bird species that have been examined (Brooks & Cook, 2010; Hoeschele et al., 2012; Hulse, Bernard, & Braaten, 1995; Watanabe, Uozumi, & Tanaka, 2005). In each case, a few individuals of each species failed or had great difficulty in learning the discrimination. Thus, chords may be hard for birds to discriminate potentially because of the considerable similarity in terms of overall frequency content. Of course, of some interest is that not all the chords were equally difficulty to discriminate, with some contrasts supporting better discrimination than others. The scaling results that become available from testing S/D judgments provide some illumination. The patterns in the scaling results are consistent with the more rudimentary findings of Brooks and Cook. Both studies revealed that the semitone manipulations of the third and fifth notes of the chords were available to the pigeons. The structural regularities in the scaling solution further suggests that the raised and lowered semitones in these different notes of the triads were also likely perceived. So in addition to the suggestion that pigeons configurally process the chord, the pigeons may also have access to the individual spectrum of the frequencies tied to specific notes within each chord. This access to the separate elements of the chords likely resulted in the regular and rectangular scaling of the chords by their third and fifth notes and their directional manipulation. If so, then the three simultaneous notes within each triad present a dilemma to the pigeons in making a S/D judgment. The two shared parts of the chords would have indicated a “same” trial. The first shared component would be the common root note, whereas the second would be the unmanipulated note. Only one note remains, differing by one or two semitones, to differentiate the two chords. As a result, most of the pitch content would be signaling the birds to respond “same,” whereas only a small portion of the content would be signaling “difference.” Thus it might not be too surprising that pigeons showed such a tendency toward “same” responding during the course of the AB probe trials. Certainly one direction for future research is to look at the combinational and independent effects of pitch. Although our research shows that pigeons possess the ability to hear the harmonic relations among chords that has at least a surface similarity to chord perception in humans, it is not clear there isn’t more involved. We will need to see at a deeper level how the perception of the fundamental frequency of individual pitches and the composite of the entire frequency spectrum are processed by birds. It will be important to determine how these parts and wholes influence their use of relational and absolute frequency information (Hoeschele, this issue; Weisman et al., 2004). There are certainly plenty of open questions regarding how birds produce, process, and use successive and simultaneous pitch information. What has emerged from different lines of experimental work is that our own mammalian experience is not a direct guide as to the avian experience of the acoustic world. From the current S/D research, it is pretty clear that pigeons can discriminate, remember, and compare auditory sequences at least over several seconds. These sequences can vary in both sequential and harmonic pitch content, including musical triads. Given this information, we could hypothesize that pigeons can hear a simple “melody” of notes over several seconds. These results further indicate that the capacity for vocal learning is not particularly critical to being able to hear and compare temporally extended complex auditory stimuli. Pigeons seem readily able to do that. More consistent with Patel’s original hypothesis regarding the role of vocal learning in beat induction, we have found little evidence that pigeons are particularly good at complex rhythm perception (Hagmann & Cook, 2010). Our recent excursions into auditory processing and cognition in pigeons has revealed their acoustic world to be more complex than previously assumed. It remains an open question as to whether pigeons can experience the musicality of human music. On the latter point, however, we find ourselves beginning to agree with Stravinsky—“To listen is an effort and just to hear is no merit. A duck hears also.” Although we have found that pigeons have many of the auditory capabilities needed to hear the fundamental elements of music, we increasingly suspect the latter may be beyond their cognitive grasp. Baptista, L. F., & Abs, M. (1983). Vocalizations. In M. Abs (Ed. ), Physiology and behavior of the pigeon (pp. 309–325). London, UK: Academic Press. Bolhuis, J. J. (2013). Birdsong, speech, and language: Exploring the evolution of mind and brain. Cambridge, MA: MIT Press. Cook, R. G., & Wasserman, E. A. (2006). Relational discrimination learning in pigeons. In E. A. Wasserman & T. Zentall (Eds. ), Comparative cognition: Experimental explorations of animal intelligence (pp. 307–324). London, England: Oxford University Press. Dooling, R. J., Brown, S. D., Park, T. J., & Okanoya, K. (1990). Natural perceptual categories for vocal signals in budgerigars (Melopsittacus undulatus). In W. C. Stebbins & M. A. Berkley (Eds. ), Comparative perception: Vol. 2. Complex signals (pp. 345–374). New York, NY: Wiley. Dowling, W. J., & Fujitani, D. S. (1971). Contour, interval, and pitch recognition in memory for melodies. The Journal of the Acoustical Society of America, 49, 524–531. Hoeschele, M., Merchant, H., Kikuchi, Y., Hattori, Y., & ten Cate, C. (2015). Searching for the origins of musicality across species. Philosophical Transactions of the Royal Society B, 370, 20140094. Marler, P. (2000). Origins of music and speech: Insights from animals. In N. L. Walin, B. Merker, & S. Brown (Eds. ), The origins of music (pp. 31–48). Cambridge, MA: MIT Press. Roberts, L. (1986). Consonant judgments of musical chords by musicians and untrained listeners. Acustica, 62, 163–171. Sachs, C. (2012). The history of musical instruments. New York, NY: Courier Corporation. Wallin, N. L., Merker, B., & Brown, S. (2000). The origins of music. Cambridge, MA: MIT Press.